Hamilton full-back Tony Stevenson has joined Second Division leaders Alloa on an emergency loan deal until the end of the season. The 21-year-old, who has not played for Accies since December 2008, spent three-and-a-half months on loan at Alloa four years ago. 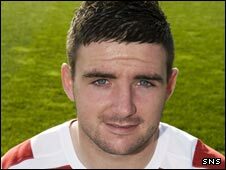 Clyde signed Stevenson from Hamilton on a similar loan deal in 2008. Stevenson, who can operate in defence and midfield, has struggled to break into Billy Reid's first-team.